Curiosity helps learning stick: how can assessments help? 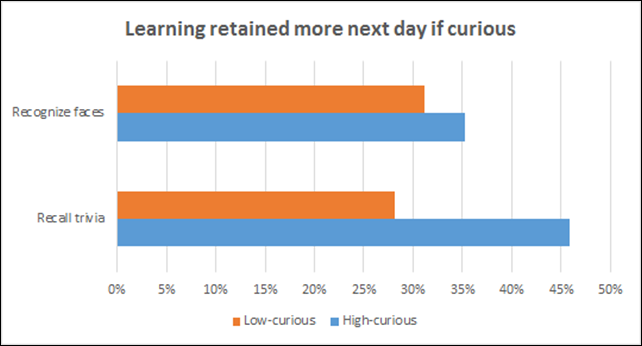 Recent learning research has provided further evidence that being curious aids retention of learning. You are more likely to remember something if you were in a curious state of mind when you learned it. This blog article explores how assessments can help. A recent study at the University of California at Davis found that people retained more information during learning when they were more curious. You can see the full paper here (paywall) and a Scientific American summary here. Participants learned a series of answers to trivia questions while at the same time seeing some unrelated faces. Curiosity was measured by asking the participants to report curiosity level and via brain scanning. When tested a day later, participants scored higher on the trivia questions when they had been more curious. They also (to a smaller extent) recognized the faces they’d seen incidentally at those times when they had been more curious. You can see the average numbers the day after the learning in the chart below – showing that people remembered about 46% of trivia information they were curious about as against 28% they were less curious about, and that they also remembered incidental faces slightly better, about 35% to 31%. Essentially the study provides evidence that people learn and retain information better when they are more curious. And it suggests that to quote the authors: “stimulating curiosity ahead of knowledge acquisition could enhance learning success”. So if curiosity stimulates learning, how can assessments help? The most obvious way is to use pre-course tests and other questions prior to learning to create intrigue and stimulate curiosity. Pre-tests have lots of other benefits – combined with a post-test they allow you to measure change from learning, and they give instructors an understanding of the topics participants know. But a key benefit from such a pre-test will be to stimulate curiosity and so put participants in a state of mind to trigger the retention benefits shown above. You can deliver questions to stimulate curiosity in many ways – but one way to consider is to deliver to mobile devices, easy to do with Questionmark software. If you have participants coming to learning, think how you could use Questionmark assessments that work on smartphones to stimulate curiosity. The other side of the coin is that people who are not curious about or interested in something will be less apt to retain what they learn about it. This is another argument for allowing testing out of compliance training. If people are forced to take training about things they already know, not only will they not be curious, but they will likely be positively de-motivated. And this could easily spread to other learners and other training, devaluing other learning and training. There are several articles on testing out of compliance training on this blog. See for example Good practice from PwC in testing out of training or Testing out of training: It can save time and money. John Kleeman will discuss the different ways to use assessments at the 2015 Users Conference in Napa Valley, March 10-13. Register before Dec. 17 and save $200.